Well hello there! It's been awhile. 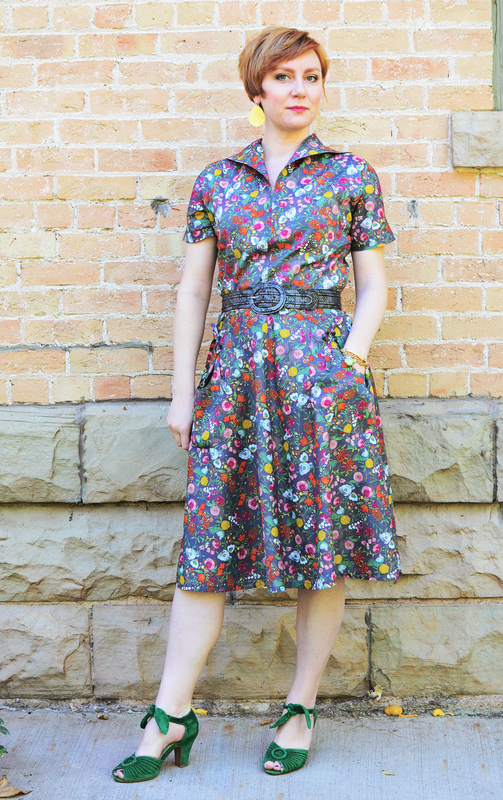 Lots of sewing has been done, just nothing documented really, so I thought I would just jump on into a dress I finished recently and was pleasantly surprised by. 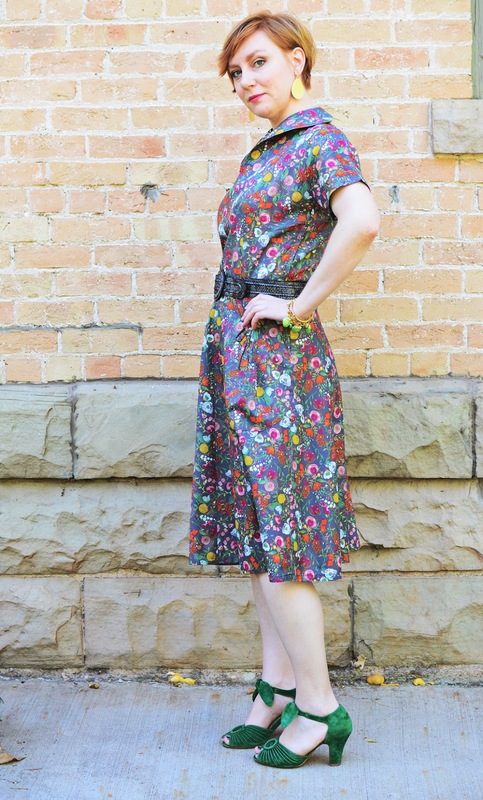 A few months ago, I purchased Butterick 6055 on a pattern buying binge at Joann. I decided to purchase several of these vintage reproduction patterns because I've been feeling a pull to vintage style because.....#reasons. I've always loved vintage, but I've also poo-pooed it because I felt really costumey in it. A couple of weeks ago, I stumbled upon Heather B's vintage transformation and that post and everything about it really really resonated with me (Heather's blog is here). I had already made this 6055 dress and instantly starting thinking, yeah WHY am I not embracing this more? I already stick out like a sore thumb because I wear dresses and skirts a lot, but why not just do that more? I mean, is there really anything to lose here? It makes me happy! 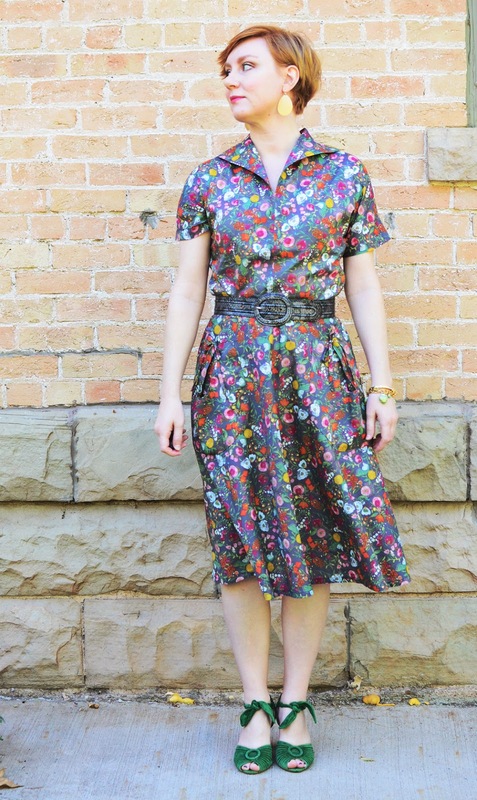 With that in mind, I made this vintage inspired frock. 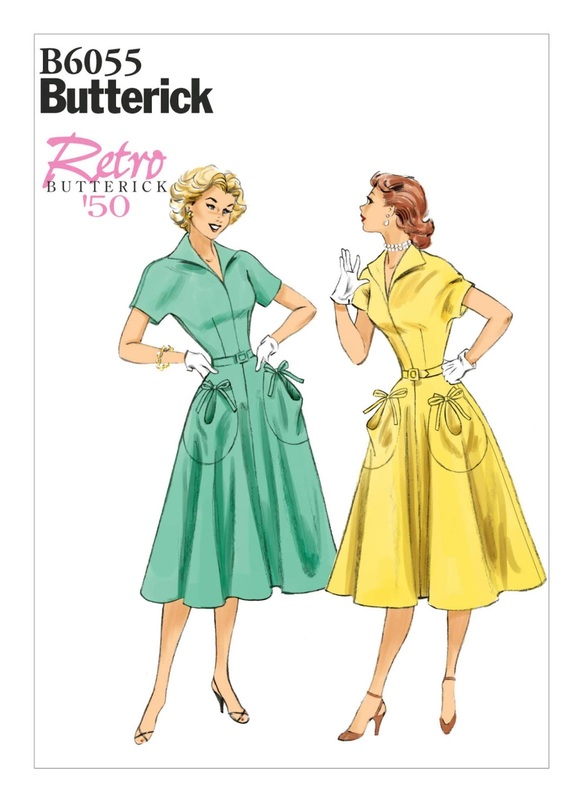 Butterick 6055 is a 1950s reproduction day dress pattern. I used an Art Gallery voile that I had in the stash and felt that the fabric and sewing pattern married really well. 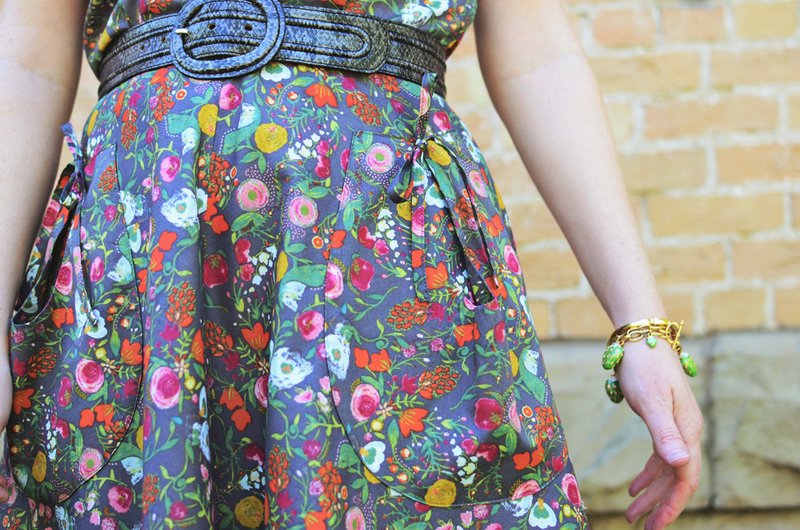 It wasn't too stiff, so the skirt wasn't crazypants, and the floral works well for this design. I made adjustments, as you may have gathered (that's a great sewing pun, right?? wink wink). I wasn't keen on those sleeves and if I'm honest, I'm not a big fan of cut-on sleeves in a woven garment anyway, so I worked on tailoring those more around the arm and that involved adding a gusset to the armpit, which I waffled about for like a week. Below is my best attempt at photographing the gusset - it's there, it's just more of a "where's waldo" kind of effort to find it. The gusset resulted in more arm movement, which is no surprise as I've read about that a lot (Kenneth King's articles in Threads on this subject are always worth the read - he does this trick mostly in jackets). The bodice had to be lengthened for me and outside of that, this dress pattern really didn't have any other fitting issues for me. Were I to make this again, I might try to add some room in the upper back. This fabric has some give and for a fabric that doesn't, this would be snug dress. I would also make the gusset in the sleeve bigger. I added a couple of belt loops in the back just because that's me. I like my belts to stay put and not float around or up and down, which they are prone to do on my body, and belt loops are the way to go for that. And yes, I went all out for the pocket and the little tie. 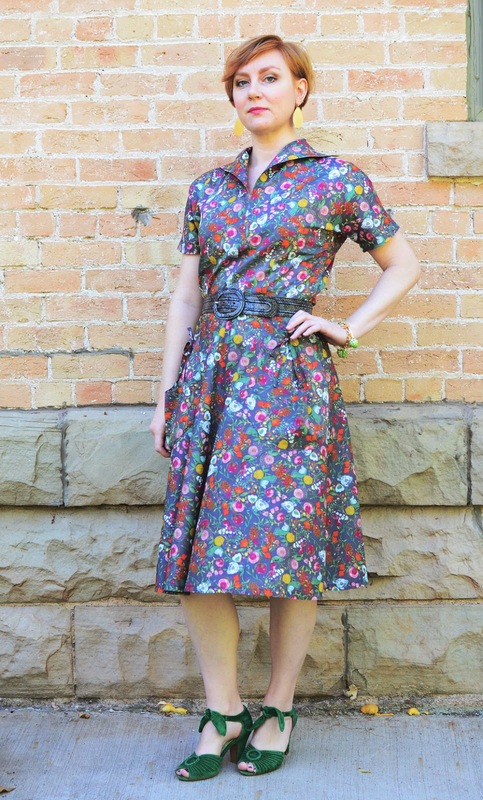 I noticed that not many who have made this dress have made the tie for the pocket and I know why, which is why I felt like the floral pattern of the fabric here helps this whole ensemble. You're able to pull off the little ties because they add texture instead of cheese. Am I right or am I right? This dress has me considering a waist cincher. Still deciding on that, but hey, why not give that a try? Maybe, dare I say, even a petticoat? 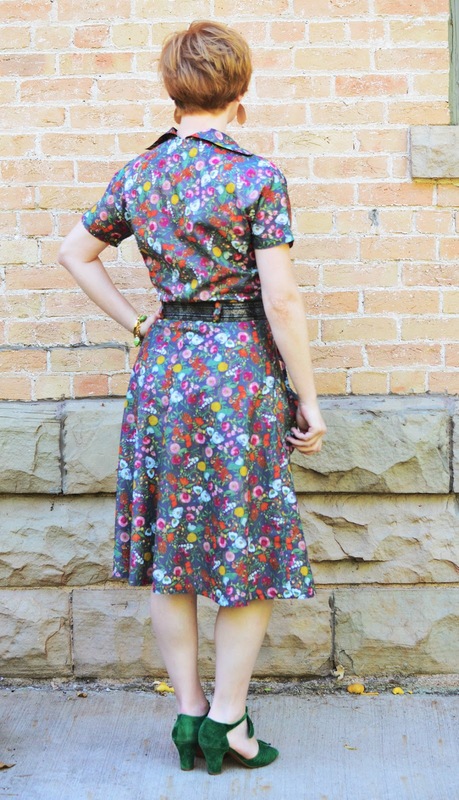 My official pattern review is on Pattern Review (here) if you're interested in making this frock yourself. 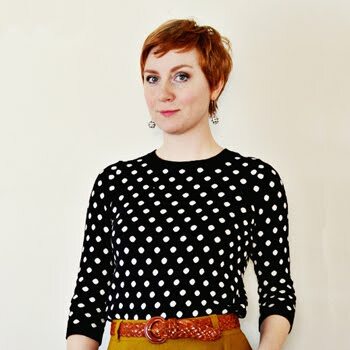 Sadly, I've written nothing of my experience making a summer collection ala Emily Hallman. I love her stuff! Gah! I was spellbound when reading about collections on her blog, so I decided to give it a try and made a black and white collection this past summer. What a revelation that whole thing was! Systems are good things! So, I'm doing a collection again. This dress is part of my Orange and Gray collection for Fall 2018. This will be the first post for that collection and I'll work on getting a page that has all my collections linked. Sewing in a collection taught me so much more about how everything works together to make a closet full of wearable garments, so I'm going to keep trying to utilize this idea in my own sewing. It's good to be putting up a blog post! I hope you are doing well (if you still read my blog....). My life has changed a lot in the past couple of years, which has been a great thing for me. I'm feeling really great about my life on so many levels. It's been a long journey but I'm happy to say that I'm HAPPY! Woot! I love sharing and being inspired by everyone's sewing creations and I really want to participate in that again. I'm looking at pulling back a lot from what I did before, which mostly means participating in very select areas online. So, I'm on Pattern Review and am looking at doing many more reviews on there - I feel this is only proper since I use that site so much but never put up anything myself. It's good to be back! More soon! Well, hello backatcha! It's great to see a posting from you. I have missed your posts, inspiration, and tips so much. I saw your review on PR and quickly jumped to see if you had posted. I love this dress! It's a great look for you, and the pattern and fabric are a perfect match. I'm so glad to hear that you are happy these days. Nothing's better than that. I look forward to anything you want to post in the future, Sunny Sewer. Why thank you! I'm so glad to know that you hopped over from PR. It's great to know that I have friends on the interwebs. Yay! OH, and those shoes! I am green with envy. They are Miss L Fire and I've ALWAYS wanted a pair and never been able to have any. Until a few months ago. I saved up some money and purchased these greenies right up. AND then I found the same style in different colors on Trashy Diva and they were on sale! For HALF THE PRICE!!! So now I have the powder blue pair and the yellow pair are on their way to me as I type. And yes this is way too much information, but we are talking shoes here. SHOES! All the SHOES! I'm so glad you are writing again! That dress is great--I recognized the fabric right away. I too have moved away from "vintage" in the past few years mostly because it began to feel costumey, and this dress looks great without looking that way--a perfect fit! I love it with those shoes too. I'm super intrigued by the collections idea--I've been doing Project 333 for several years now, and am starting to refine my process with it. I am using a palette (of sorts) with my rotations lately, but I need to do more thinking about it. I don't make the whole rotation (obvs) but I do try to build them around a color palette. I'm eager to read your thoughts about your collections!! I'll post more about collections. I'm considering doing a round-up of my Summer 2018 collection. It was so great. I found the process challenging, but in a good way. The end result works wonderfully for my wardrobe too. So much easier to get dressed in the morning. Woot! Welcome back!!! I think a petticoat is definitely the way to go - gives the illusion of a smaller waist but is WAY more fun to wear! So nice to see a post for you. Thanks for the link to Heather B and Emily Hallman. Heather's epiphany is so lovely to read. And the collection idea is so inspiring. I LOVE Heather B so much. Plus she is positively hilarious to read. Oh my gosh! I burst out laughing all the time reading her blog. She's wonderful. I've loved reading Emily Hallman too. Great processes and her style is so fun to watch. That fabric! And those shoes! This outfit is perfect. Beautiful dress. A lovely surprise to see your post pop up in my feed. I'm interested to follow along with your new collection. I love the little pocket ties. In this print they look like a fashionable detail. I wonder if they might look too juvenile in other fabrics. Yes, I agree. I can definitely see why people have hesitated adding them to the dress. It's one of those things that can go from professional to becky-homecky in a matter of seconds. Hello there, glad to see you! It’s a very swell dress. So glad you’re back! You were very much missed. Also, that dress is amazing! Lovely dress. It looks great on you and no not at all costumey or cheesy. Good to see you back. The dress is wonderful and it's great to have you back in this space! That fabric works perfectly with the pattern, and I agree with you about the ties. Not costumey, just fun and classy. So glad to hear that you're happy. So fun to see your post pop up in my feed. Great to hear that you are happy and am embracing the vintage style you are drawn too. Sewing and style will always be part of the life's journey! Thank you! I'm excited about it. I don't know that I'll ever pull off an all out vintage look, but I like incorporating it into my style as it is now. Vintage vibes is I think a good name for it. Wonderful to see a post from you. I agree about vintage can feel costumey. I felt like I could pull it off like your re rn. Great dress, good pun, and thanks for sharing. Thank you Heather! I'm so inspired by you. I just love everything you do. And how is it that you are so hilarious?!! I laugh so hard when I read your blog!!! It's wonderful! So glad you are back! I always enjoyed your posts before. Love, love, love this dress! The fabric is perfect for the style, and it looks fab on you. Looking forward to hearing more about your collection! What a pleasant surprise to see your post in my blog reader! I would love to know more about how you added the gusset. The dress looks fabulous. I'm inspired to buy (and make) this pattern.